for this Assam APSC Finance Service Exam 2018. For APSC Finance & Accounts Officer Recruitment 2018 candidates must be a Commerce Graduate. Total 30 vacancies are in this APSC Finance & Accounts Officer Recruitment 2018. APSC is recruiting these Finance and Accounts officer posts to fill the available vacancies in Assam Finance Service of Assam State. Selection for APSC Finance & Accounts Officer Vacancy Recruitment will be through Written Exam and interview. Last date for offline application form submission for this APSC Finance & Accounts Officer Jobs is 10-08-2018. 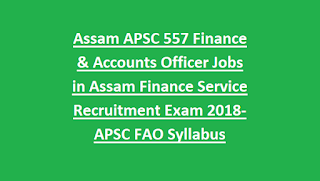 For more details regarding Assam PSC Finance & Accounts Officers Jobs vacancies, selection process, salary, application fee, qualification, FAO Exam Pattern, FAO Exam Syllabus, age limits, FAO jobs offline application process and more details are given below. There are total 30 Finance & Accounts Officer vacancies available in this Assam PSC latest govt jobs recruitment of APSC Assam Finance Service Exam Notification. For Lecturer Posts: 18-38 years as on 01-01-2018. For SC/ST candidates upper age limit is 43 years and for OBC/MOBC candidates upper age limit is 41 years. For Finance & Accounts Officer Jobs in Arts/Commerce/Science Degree qualified candidates are eligible to apply online. Pay Scale is applicable as per Assam Finance Service cadre posts. For SC/ST/OBC/MOBC candidates application fee is Rs.150/-. The selection for APSC Finance & Accounts Officer and FAO Jobs is through written exam and interview. Written Exam will be conducted for 350 marks. Written Exam consists of 3 papers. 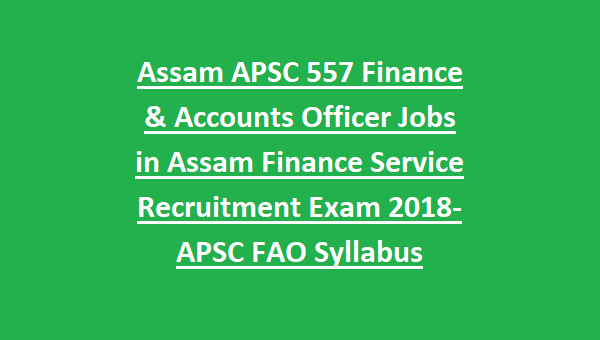 APSC Assam Finance Service posts offline form submission last date is 24-08-2018. Download application form from official website of www.apsc.nic.in. On cover letter mention clearly ‘Assam Finance Service Examination, 2018’. And send the filled application form to Secretary, APSC, Jawaharnagar, Khanapara, Guwahati-22 before the closing date.